Recently Pastor Roger Voegtlin retired as senior pastor of Fairhaven Baptist Church in Chesterton, Indiana, and as head of Fairhaven Baptist College. I have known of Pastor Voegtlin since the 1980s, and I have known him personally for about 20 years. But it has only been in the last few years that I have gotten to know him very well, and the more I have gotten to know him, the better I have appreciated and loved him. He founded Fairhaven Baptist Church in 1970, and it has prospered under God’s blessing. Thousands of souls have been saved and lives changed for the glory of Christ. I have seen the fruit personally. These days the church has a large number of young families who are raising their children for Christ. These children are the third generation of Pastor and Sister Voegtlin’s ministry. On my last visit to Fairhaven (March 2015), I talked with an older gentlemen who is a longtime member of the church. As one of my passions these days is “keeping the next generation” and youth discipleship, we were discussing that topic. He said that he moved to that area decades ago and purchased a house about an hour and a half (if I remember correctly) from Fairhaven Baptist Church. Only after purchasing the house did he attend Fairhaven and realize that God wanted him to join the church and raise his young family there. Instead of dismissing the Lord’s leading by arguing that he had already purchased a house and that this move would not be convenient, he determine to obey. He put his house on the market and began commuting to every service from that long distance. If I remember correctly, the house didn’t sell for a couple of years, but the family continued to make the drive three or four times a week until they could relocate. His children grew up in the church and in the church’s Christian school. They were saved and devoted their lives to Christ, and now they are raising this man’s grandchildren, a third generation, for the Lord at the same church. He pointed out to me his children and their children, and it was a thrill, as always, to see multiple generations serving Christ. Fairhaven has had a lot of fruit of this caliber, and it is the product of the labor of a great many people, but all of it was accomplished under Pastor Voegtlin’s leadership and oversight. Everyone who knows me knows that I am not a hero worshipper, and Pastor Voegtlin is the first to admit that he is not perfect, but I am convinced that the late Dr. Lee Roberson’s dictum is true that “everything rises and falls on leadership.” Godly fruit does not come from a rotten tree. Every believer has spots in his spiritual true, which is why the business of putting off the old man and putting on the new is a continuous process, but the predominant character of the tree will be evident by its fruit. One of the many things I have come to appreciate about Pastor Voegtlin is the fact that he is a warrior. He is not any kind of pacifist. He is not a politician, as so many prominent independent Baptists are. Most of them will speak as if they are genuinely bold for the truth, but they know how to “play the game” so as not to offend the big names and rock the boat. In fact, most of them know how not to offend their own church members. Pastor Voegtlin doesn’t believe in the popular principle that it is wrong to point out serious error in a fellow Baptist preacher and ministry. As far back as 1989, he preached a scathing sermon warning about Jack Hyles’ sins and errors entitled “Why I Am Not 100% for Jack Hyles.” Seeing that Hyles was the most prominent Independent Baptist preacher at the time and was yet bringing shame to the cause of Christ, every independent Baptist preacher in the country should have joined his voice in approval with that sermon and its carefully documented facts. A few did, but most kept silent, demonstrating either spiritual pacifism and cowardliness or a lack of spiritual discernment and conviction. Pastor Voegtlin hasn’t just given lip service to separation. He has practiced it in the church and school. He has campaigned for it, and he has not weakened in his convictions as he has gotten older, as so many have, even having conferences in recent years focusing on biblical separation, both separation from the world and ecclesiastical separation. That is exceedingly rare today. For many years, Fairhaven required that its students read O Timothy magazine to be informed of separation issues. I can count on less than the fingers of one hand the number of Independent Baptist Bible colleges today that fly the flag of biblical separation and are training their students in separation issues properly and are willing to apply separation to their relationships with compromising independent Baptists. Doubtless one reason why America is no longer the “land of the free and the home of the brave” is the lack of bravery in the pulpits. 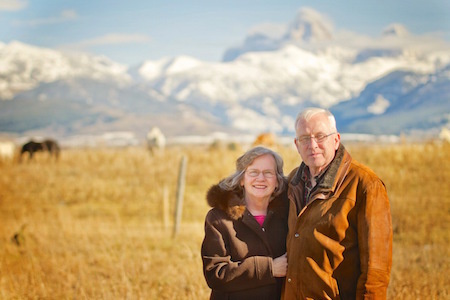 Pastor and Mrs. Voegtlin have moved to Idaho to help start a new church. That new plant has not yet begun, as the missionary, Daniel McDonald, is still raising support. In the meanwhile, Pastor Voegtlin told me recently that they are building a house, attending church in Jackson, Wyoming, knocking doors on visitation, and doing some preaching here and there. I don’t know how much Bro. Voegtlin wants to travel these days, but pastors reading this might pray about inviting him to speak. He has decades of experience and will be a blessing to you.